Before the Creek Indians sold their land in 1821, the area now in the City of East Point was wild forests. By the end of that year, Georgia had five new counties, and most of those were parceled out via the land lottery in 202.5-acre homesteads. The 27 acres of Connally Nature Park (Park) were in Henry County until 1822 when DeKalb County was formed from parts of Henry, Gwinnett and Fayette counties. David Connally and his two brothers Abner and Christopher Columbus Connally bought land in the western part of that county. Soon, much of the forests were stripped and plowed to make David’s plantation. Because this was a much different era, slaves were among those who constructed buildings and a grist mill on another branch of Utoy Creek, harvested wheat and other crops. Fulton County was established in 1853 out of DeKalb. East Point became a city in 1887. From fields, the land became developments for houses and some to forest again. The Mulberry Court entrance area to the Park saw houses built and removed. In 1974, "core samples of trees taken by Emory professors indicate white oaks to be over 250 years of age"– Chronology of the Thomas W. Connally Nature Park. Hence the age is now approaching 300. The heirs were fed up with the city water works encroaching on the property by 1991, and eventually sold it to the City. The very next year, the City was prepared to clear cut and put in ball fields, but didn’t. In 1998, Fulton County Board of Education (FCBE) was blocked in a search for school site. They turned to East Point, which sold the Park to them. Residents were upset—some disliked the idea of yelling kids across the street, while others wanted to keep the property as a park. The next year, the battle heated up. The Sierra Club, Upper Chattahoochee Riverkeepers, and other groups came in to support keeping it as a park. FCBE asked the Georgia Environmental Protection Division (EPD) for a permit to put the Utoy Creek branch underground. There are demonstrations and court dates, and with complaints ringing in their ears, the FCBE agreed to move the school footprint westward across Mulberry Street so stream buffer would not be affected (this was a separate buy and afterwards, the new purchaser took down five houses to build the Sheltering Arms Early Education complex). In January 2000, new members joined city council with some supportive of the Park. But it was a long year of citizen and court actions. Sierra Club filing suit against the EPD and FCBE definitely helped save the trees and the plant communities. The school plan would have saved up to seven of the 25+ old oaks. Even if they saved those trees, can you image keeping 500 kids from trampling around the trees and com-pressing the soil? Also, would the area around the trees have been large enough to support the needs of the trees or would it have just been a slow death? In the 13 years since the major battles, we have seen the death of the huge white oak near the entrance to the forest due to tractor work done at the very beginning clipping the roots. Invasive plants are running wild, with English ivy running up trees, and covering wide areas of the forest floor killing native plants. Someone has a trash camp not far from Connally Drive. However, there are groups willing to help. Because the winter had periods of cold, warm, then cold again – plants were later this year than last. 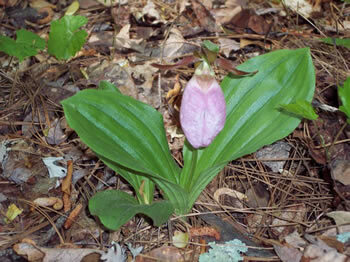 Pink ladyslippers weren’t in bloom during the first week in April. However, there were many surprises for the groups that hiked later in April. Several ladyslippers were in more areas than before. There were more than a half dozen fern species and both Solomon seal and Solomon plume in good display.